Mouse anti Human CD151 antibody, clone 11G5a (MCA1856) used for the detection of CD151 positive microdomains on the surface and in intracellular vesicles in pseudovirus infected HeLa cells by immuneoelectron microscopy. 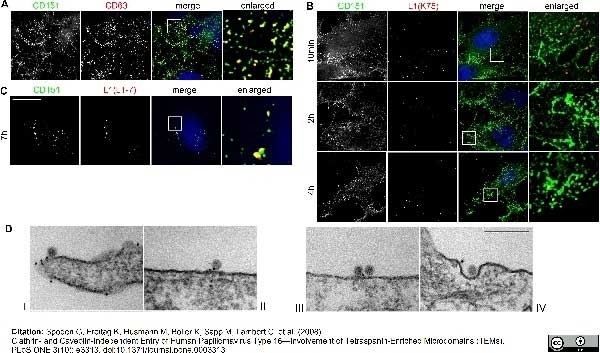 Virions associate with CD151 positive microdomains on the cell surface and in intracellular vesicles. (A) HeLa cells were fixed with paraformaldehyde and the cell surface was immunostained with a monoclonal anti-CD63 antibody and polyclonal anti-CD151 antibody. (B) HeLa cells were exposed to HPV16 pseudovirions for the indicated time periods, and fixed with paraformaldehyde. The cell surface was immunostained with polyclonal anti-L1 antibody (K75, red) and a monoclonal anti-CD151 antibody (sc-5275). Inserts display enlarged sections that are shown in the right column. (C) HeLa cells were exposed to HPV16 pseudovirions for 7 hours. Cells were fixed and permeabilized with methanol. Intracellular PsVs were immunostained with monoclonal anti-L1 antibody (L1-7, red) and CD151 with a polyclonal anti-CD151 antibody (sc-33123, green). Bars, 20 μm. (D) HeLa cells were infected with pseudovirions for 4 hours and then fixed with paraformaldehyde. Cell surface CD151 was immunolabeled with 10 nm gold particles. Pseudovirions and CD151 were visualized by electron microscopy. Bar, 200 nm. Clathrin- and Caveolin-Independent Entry of Human Papillomavirus Type 16—Involvement of Tetraspanin-Enriched Microdomains (TEMs). Mouse anti Human CD151 antibody, clone 11G5a (MCA1856) used for the detection of CD151 expression on the surface and in intracellular vesicles in pseudovirus infected HeLa cells by immunofluorescence. Figure 8. Inhibition of HPV16 pseudovirus entry in HeLa cells. (A) HeLa cells were treated with control and CD151 specific antibody as indicated. Entry of AlexaFluor conjugated transferrin (upper panels) or HPV16 PsVs (lower panels) was analyzed. Cells were fixed with MetOH and stained with monoclonal L1 (L1-7) antibody. (B) HeLa cells were transfected with control (upper panels) or CD151 siRNA (lower panels). Entry of AlexaFluor conjugated transferrin was analyzed. (C, D) HeLa cells were treated with siRNA and infected with HPV16 PsVs for 12 hours. Cells were either fixed and permeabilized with methanol and PsV uptake was analyzed by immunostaining with monoclonal L1 (L1-7, red) and polyclonal anti-CD151 antibodies (green) (C), or cells were fixed with paraformaldehyde and surface staining was performed with polyclonal L1 antibody (K75, red) and monoclonal anti-CD151 (green) antibody as indicated (D). Bars 20 μm. Identification of tetraspanin CD151 network and functional analysis. CD151-containing complexes were solubilized using the mild detergent, Brij97, and were isolated by immunoprecipitation using specific CD151 mAbs. Associated proteins were eluted using Triton X-100 and separated by SDS-PAGE (A). After in-gel trypsin digestion of proteins, the resulting peptides were analyzed using LC-MS/MS (B and C). The peptides were separated by nano-HPLC. Total ion count was measured and visualized on a chromatogram (upper panel). At a precise time (e.g. 55.33 min for CD151 and 67.18 min for integrin β1, dotted straight line), the mass spectrum obtained is shown (middle panel) in which a parent ion can be selected (e.g. m/z = 643.3489 for CD151 and 1010.0838 for integrin β1, black arrow). Fragmentation of that parent ion led to MS/MS spectrum generation containing b and y ions, and thus sequence information of the parent ion (lower panel). The amino acid sequence can be deduced after searches in the NCBI database using the program SEQUEST. The putative sequence of the peptide is shown with associated Xcorr and ΔCn. This peptide sequence led to the identification of CD151 and integrin β1. These peptides were converted into a gene symbol and rearranged according to GO functional enrichment provided by DAVID website. Then, the “tetraspanin CD151 web” was organized by the cytoscape (Ver: 2.6.2, http://www.cytoscape.org/), searching target genes that interacted with CD151, and removing genes that were not contained in our target genes using a data source (NCBI Entrez EUtilities Web Service Client) (D). Gene ontology analysis of the 57 molecular partners was performed. They were classified as 13 categories of biological processes including protein folding and cell migration (MOES, TSP1, c-MET, NRP1, ITA6, ITB1 and GIPC1) according to categories of the “GO Biological Process” (E). Western blotting identified CD151 formed complexes with integrin α6 and β1 in HCCLM3 cells as well as HepG2 cells, but not in normal hepatocytes L-02 (F). 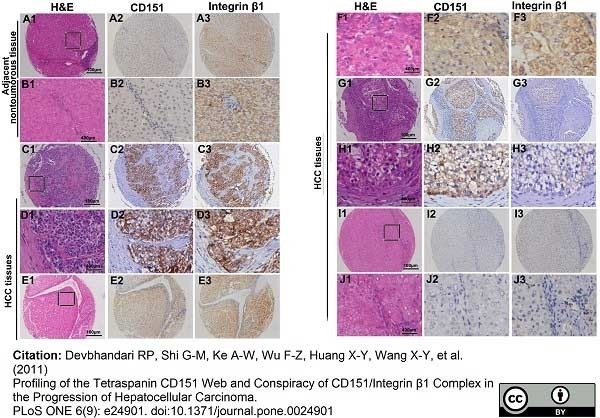 Profiling of the Tetraspanin CD151 Web and Conspiracy of CD151/Integrin β1 Complex in the Progression of Hepatocellular Carcinoma. Location and expression of CD151/integrin β1 complex in HCC cells. An immunofluorescence assay was performed. CD151 was stained with red and integrin β1 was stained with green. CD151 and integrin β1 co-localized on the plasma membrane in HCCLM3 cells (A). Western blotting revealed that the expression of CD151 in high metastatic HCCLM3 cells was highest and non-metastatic HepG2 cells presented the lowest levels of CD151 among six HCC cells. The results also demonstrated high expression of integrin β1 in six HCC cells lines (B). Flow cytometry analysis showed that the high proportion of integrin β1-positive cells were in six HCC cells (C). After transfection, HCCLM3-shRNA 2# was most efficient in downregulating the expression of integrin β1 at both the protein and mRNA levels (D). The level of integrin β1 expression remained unchanged in HCC interfered with CD151 shRNA, and vice versa (E). Mouse anti Human CD151 antibody, clone 11G5a (MCA1856) used for the evaluation of CD151 expression in tumor tissue sections by immunohistochemistry. Expression of CD151/integrin β1 complex in HCC patients by immunohistochemistry. After identification by H&E staining (A1, B1, C1, D1, E1, F1, G1, H1, I1, and J1), CD151 was mostly located on the membrane of tumor cells, with comparable variation (A2, B2, C2, D2, E2, F2, G2, H2, I2, and J2) and strong integrin β1 expression in most HCC cells, stroma fibroblasts, and epithelial cells of the bile duct (A3, B3, C3, D3, E3, F3, G3, H3, I3, and J3). A and B refer to adjacent nontumoral tissue. Representative tumor tissues are shown :C and D high expression of CD151 and integrin β1, E and F high expression of CD151 and low expression of integrin β1, G and H high expression of integrin β1 and low expression of CD151, I and J low expression of CD151 and integrin β1. Published customer image:R-phycoerythrin conjugated Mouse anti Human CD151 antibody, clone 11G5a (MCA1856PE) used used to stain porcine peripheral blood derived macrophages by flow cytometry. ΔSRCR5 peripheral blood monocyte-derived macrophages (PMMs) are fully differentiated and express macrophage-specific markers.Peripheral blood monocytes were isolated from the blood of the wild type (red), heterozygous (blue), and ΔSRCR5 (green) animals. Following cultivation in the presence of recombinant human CSF1 (rhCSF1) for seven days PMMs were analyzed by FACS. A) Co-staining with CD14-FITC and CD16-PE antibodies recognizing the native structure of the proteins (colored contour plots; red wild type, blue heterozygous, green ΔSRCR5) relative to isotype controls (grey). B) Co-staining with CD169-FITC and CD172a-PE antibodies recognizing the native structure of the proteins (colored contour plots) relative to isotype controls (grey). C) Co-staining with SWC9 (CD203a)-FITC and CD151-RPE antibodies recognizing the native structure of the proteins (colored contour plots) relative to isotype controls (grey). D) Staining against the native structure of surface expressed CD163 (colored) relative to an isotype control staining (grey). 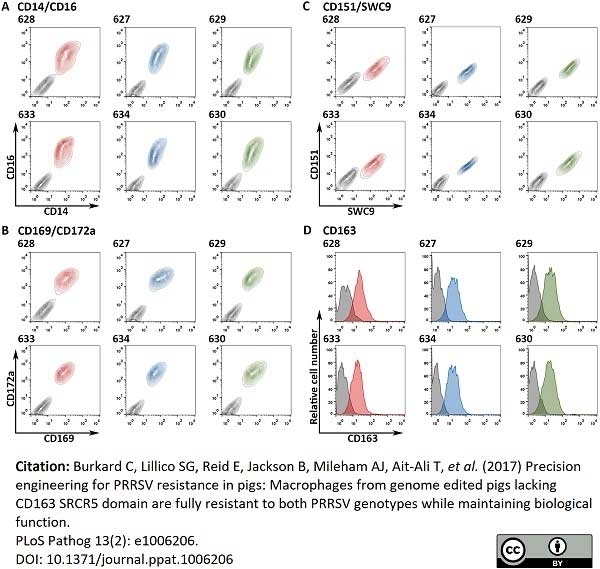 Precision engineering for PRRSV resistance in pigs: Macrophages from genome edited pigs lacking CD163 SRCR5 domain are fully resistant to both PRRSV genotypes while maintaining biological function. Mouse anti Human CD151 antibody, clone 11G5a recognizes the human CD151 cell surface antigen, also known as PETA-3. CD151 is expressed by epithelial cells, endothelial cells, platelets, megakaryocytes, monocytes and in the renal glomeruli and proximal and distal tubules. CD151 is not expressed by lymphocytes or granulocytes. More recently CD151 has also been shown to be expressed by erythrocytes, and to carry the MER2 blood group antigen (Crew et al. 2004). It should be noted that CD151 is very closely associated with the alpha3 beta1 integrin in cells and co-immunoprecipitation may occur even in quite stringent conditions (Yauch. et al. 1998). 1 This product requires antigen retrieval using heat treatment prior to staining of paraffin sections.Sodium citrate buffer pH 6.0 is recommended for this purpose. 2 Clone 11G5a recognises human CD151 under non-reducing conditions. Karamatic Crew, V. et al. (2004) CD151, the first member of the tetraspanin (TM4) superfamily detected on erythrocytes, is essential for the correct assembly of human basement membranes in kidney and skin. Ke, A.W. et al. (2011) CD151 amplifies signaling by integrin α6β1 to PI3K and induces the epithelial-mesenchymal transition in HCC cells. Zheng, Z. & Liu, Z. (2006) CD151 gene delivery activates PI3K/Akt pathway and promotes neovascularization after myocardial infarction in rats. Mol Med. 12 (9-10): 214-20. Zheng, Z. & Liu, Z. (2007) CD151 gene delivery increases eNOS activity and induces ECV304 migration, proliferation and tube formation. Acta Pharmacol Sin. 28 (1): 66-72. Franco, M. et al. 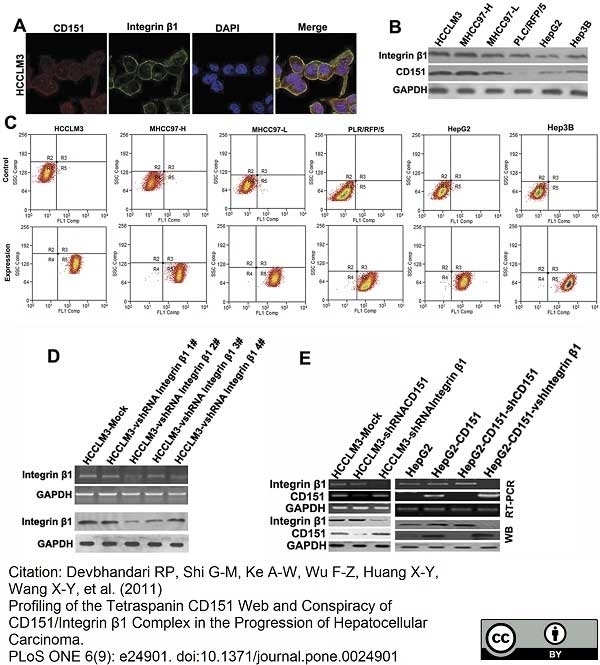 (2010) The tetraspanin CD151 is required for Met-dependent signaling and tumor cell growth. J Biol Chem. 285 (50): 38756-64. Hasegawa, M. et al. (2007) CD151 dynamics in carcinoma-stroma interaction: integrin expression, adhesion strength and proteolytic activity. Spoden, G. et al. (2008) Clathrin- and caveolin-independent entry of human papillomavirus type 16--involvement of tetraspanin-enriched microdomains (TEMs). Huang, X.Y. et al. (2010) Overexpression of CD151 as an adverse marker for intrahepatic cholangiocarcinoma patients. Ke, A.W. et al. (2009) Role of overexpression of CD151 and/or c-Met in predicting prognosis of hepatocellular carcinoma. Devbhandari, R.P. et al. 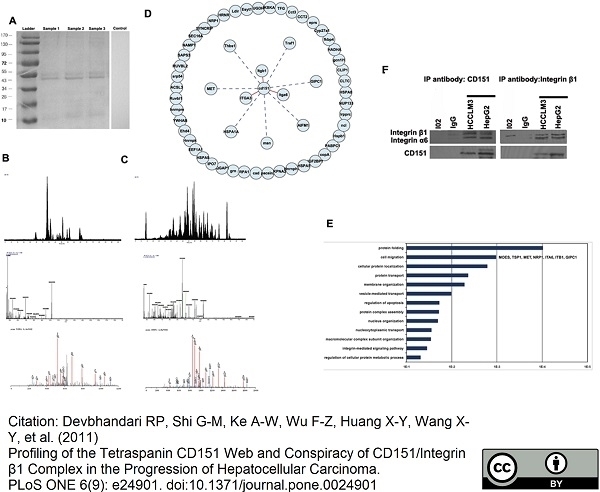 (2011) Profiling of the tetraspanin CD151 web and conspiracy of CD151/integrin β1 complex in the progression of hepatocellular carcinoma. Shi, G.M. et al. (2010) CD151 modulates expression of matrix metalloproteinase 9 and promotes neoangiogenesis and progression of hepatocellular carcinoma. Nishiuchi, R. et al. (2005) Potentiation of the ligand-binding activity of integrin alpha3beta1 via association with tetraspanin CD151. Proc Natl Acad Sci U S A.102: 1939-44. Qiao, Y. et al. (2017) CD151, a laminin receptor showing increased expression in asthmatic patients, contributes to airway hyperresponsiveness through calcium signaling. J Allergy Clin Immunol. 139 (1): 82-92.e5. Hochdorfer, D. et al. 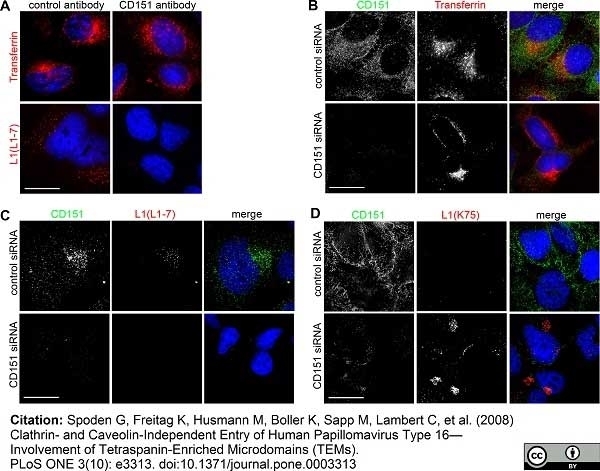 (2016) Tetraspanin CD151 Promotes Initial Events in Human Cytomegalovirus Infection. J Virol. 90 (14): 6430-42. WadkinJ, C.R. et al. (2017) CD151 supports VCAM-1-mediated lymphocyte adhesion to liver endothelium and is upregulated in chronic liver disease and hepatocellular carcinoma. Am J Physiol Gastrointest Liver Physiol. 313 (2): G138-G149. Burkard, C. et al. (2017) Precision engineering for PRRSV resistance in pigs: Macrophages from genome edited pigs lacking CD163 SRCR5 domain are fully resistant to both PRRSV genotypes while maintaining biological function. PLoS Pathog. 13 (2): e1006206. Kwon, M.J. et al. (2012) Clinical significance of CD151 overexpression in subtypes of invasive breast cancer. Br J Cancer. 106: 923-30. Yauch, R.L. et al. (1998) Highly stoichiometric, stable, and specific association of integrin alpha3beta1 with CD151 provides a major link to phosphatidylinositol 4-kinase, and may regulate cell migration. Mol Biol Cell. 9 (10): 2751-65.